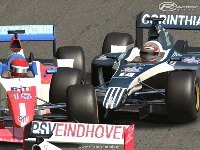 2008 season of Superleague Formula. The car model is the FormulaIS but physics, skins, tyres, etc. are new. Thanks to Calico-Jack to make the skins. I put the templates of the car and helmet. If you like, you can make new skins of your favorite team!!! There are currently no setups for Superleague Formula 2008. Add a Setup. The Simbol of Corinthians is wrong! Fix! can we modify de mod for f1challenge?